When you arrive in port in Mykonos, head out on a private shore excursion to the island of Delos, where you'll discover its legends and its beauty. Your private guide will lead you to the Agora, the Sacred Way and the Temple of Apollo. Go back in time as you visit the remains of a Hellenistic quarter and see its harbors and former luxurious villas, such as the House of Cleopatra and the House of Dionysus. 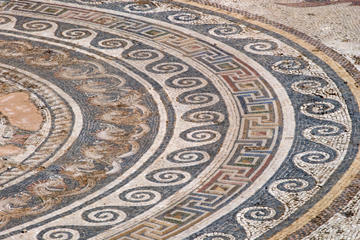 Admire beautiful 2,500-year-old mosaic floors and marble sculptures from the 8th century BC. While you are in port in Mykonos, experience the beauty of neighboring island Delos on a private shore excursion. Delos was a holy sanctuary for a thousand years, and is it believed to be the birthplace of the Greek gods Apollo and Artemis. When you arrive in Delos' harbor, see your first mythological sight two conical mounds on the horizon, one of which is crowned with a sanctuary of Dionysus. Follow your private guide to the Agora, an open space where Italians merchants used to meet. Continue along the Sacred Way and marvel at the Temple of Apollo and the remains of a Hellenistic quarter. Walk around old harbors and former luxurious private houses, like the House of Cleopatra, the House of the Dolphin, the House of Dionysus and other notable homes. Contemplate the traditional Greek architecture and mosaic floors, which have survived for more than 2,500 years. End your walking tour by enjoying the spectacular views of the Avenue of Lions, where five replicas of Naxian beasts from the 8th century BC stand. The marble sculptures are known to be the vigilant guardians of the Sacred Lake, which has been intentionally left dry. We will ensure your timely return to the Mykonos port for this activity. In the rare event your ship has departed, we will arrange for transportation to the next port-of-call. If your ship is delayed and you are unable to attend this activity, your money will be refunded. See our terms and conditions for full details.